Teething Mittens. Knitted bear mittens with wooden teething rings. Knitted bear teething mittens for babies. Teething Mittens. Knitted baby mittens with wooden teething rings. Knitted bear teething mittens for babies. 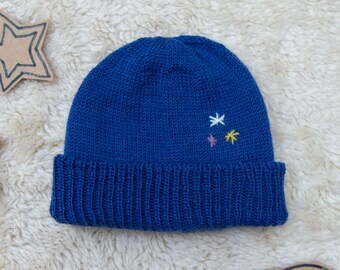 Great pattern, easy to read instructions, thank you! Panda Mittens and Hat Set. Mustard Yellow knitted mittens and hat set. baby, toddler and child mittens and hat luxury gift set. Absolutely lovely and very well written. It was a joy to work with, thanks. At the Etsy Christmas Market yesterday I brought along some mustard panda mittens and have a few pairs left. I'll be adding them to the shop asap! They are so lovely! I had the privilege of being at the London Design Fair last month with the winners of the Etsy Awards. Such a great weekend surrounded by so many talented designers! Loved it! BUTTON AND BLUE is a British knitwear brand that was founded in 2015 by designer and maker Amy Philip. Our knitwear is known for its high quality craftsmanship using the finest natural fibres and for its contemporary playful design. Each piece in the label is handmade from a home studio in Brighton, using fine yarns sourced from West Yorkshire. Our garments are designed with little ones in mind and with great attention to detail. This makes our knitwear comfortable, fun to wear and made to last. Button and Blue favours minimal, gender neutral design with playful details. 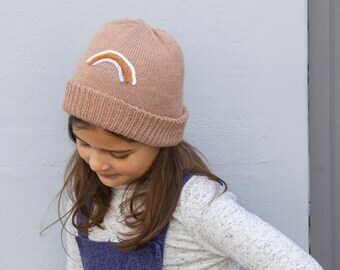 With this combination of high quality craftsmanship and fun design, Button and Blue creates knitwear that parents want to dress their little ones in and that little ones love to wear. Having learnt to knit when she was young, Amy took up knitting again when she was pregnant with her eldest daughter in 2010. Disappointed with the knitting patterns available at the time, Amy began designing her own knitwear appealing to a more modern, design-led aesthetic. She opened an Etsy shop in 2015 and due to high demand, invested in a knitting machine to increase production. The first collection was awarded a Gold Award in the Etsy Awards 2016 and Button and Blue has gone on receive national press and to win the Best Small Business Award in the Handmade Awards 2018. 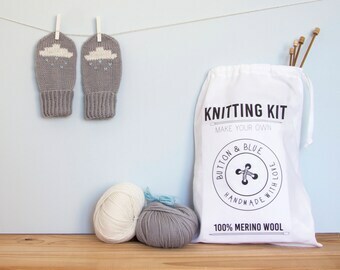 Alongside our seasonal knitwear collections, Button and Blue released its first range of knitting kits through a successful crowdfunding campaign in 2017. Amy’s understanding of knitwear design which comes from years of designing and from hand-making every customer order has been poured into the kits and knitting patterns. 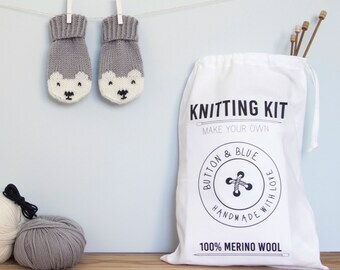 Our knitting kits make it simple for you to make your own contemporary knitwear for little ones, from the finest natural fibres.